The spectrum of mechanical loading conditions applied to articular cartilage in the synovial joint. At one end of the spectrum, articular cartilage is subjected to cyclic hydrostatic pressure when an individual walks or runs. Alternatively, astronauts on long-term space missions experience mechanical unloading within their joints. To simulate these conditions experimentally, loading can be simulated using a hydrostatic pressure vessel and unloading can be simulated in a rotating wall vessel bioreactors. Credit: Aerospace Medicine and Human Performance. 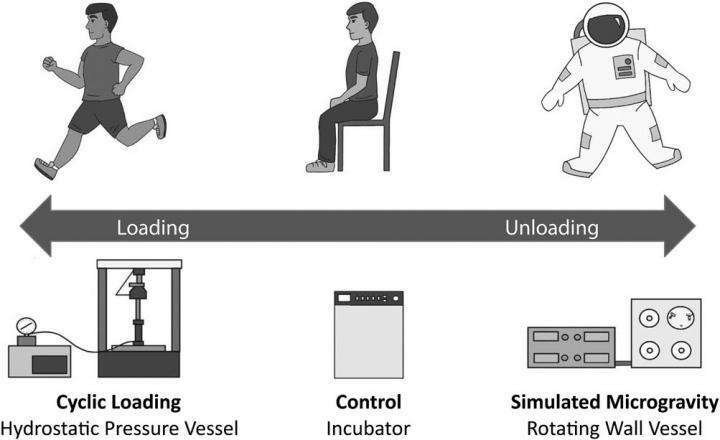 Mechanical loading, or forces that stimulate cellular growth for development, is required for creating cartilage that is then turned to bone; however, little is known about cartilage development in the absence of gravity or mechanical loads. Now, in a study led by the University of Missouri, bioengineers have determined that microgravity may inhibit cartilage formation. Findings reveal that fracture healing for astronauts in space, as well as patients on bed rest here on Earth, could be compromised in the absence of mechanical loading. "Cartilage tissue engineering is a growing field because cartilage does not regenerate," said Elizabeth Loboa, dean of the MU College of Engineering and a professor of bioengineering. "Because these tissues cannot renew themselves, bioreactors, or devices that support tissue and cell development, are used in many cartilage tissue engineering applications. Some studies suggest that microgravity bioreactors are ideal for the process to take place, while others show that bioreactors that mimic the hydrostatic pressure needed to produce cartilage might be more ideal. Our first-of-its-kind study was designed to test both theories." Chondrogenic differentiation is the process by which cartilage is developed and cartilage is the basis for bone formation in the body. Additionally, cartilage does not renew itself once it breaks down or fails in the body, making it a target for bioengineers who wish to help patients regenerate cartilage from other cells. Using human adipose, or fat cells (hASC) obtained from women, Loboa and her team tested chondrogenic differentiation in bioreactors that simulated either microgravity or hydrostatic pressure, which is the pressure that is exerted by a fluid. Researchers found that cyclic hydrostatic pressure, which has been shown to be beneficial for cartilage formation, caused a threefold increase in cartilage production and resulted in stronger tissues. Microgravity, in turn, decreased chondrogenic differentiation. "Our study provides insight showing that mechanical loading plays a critical role during cartilage development," Loboa said. "The study also shows that microgravity, which is experienced in space and is similar to patients on prolonged bed rest or those who are paralyzed, may inhibit cartilage and bone formation. Bioengineers and flight surgeons involved with astronauts' health should consider this as they make decisions for regenerating cartilage in patients and during space travel." The study, "Comparison of Simulated Microgravity and Hydrostatic Pressure for Chondrogenesis of hASC," was published in Aerospace Medicine and Human Performance. Funding was provided by the National Space Biomedical Research Institute through NASA (NCC9-58), the National Institutes of Health (IR03EB008790) and the National Science Foundation (1133437). The content is solely the responsibility of the authors and does not necessarily represent the official views of the funding agencies. Liliana F. Mellor, Andrew J. Steward, Rachel C. Nordberg and Michael A. Taylor from the Joint Department of Biomedical Engineering at North Carolina State University and the University of North Carolina, contributed to the study.